For purposes of rolling easements, a key difference between wetland shores and ocean beaches is that tidal flooding, rather than waves, governs the conversion from dry land to intertidal habitat (see Box 2). Land elevation rather than distance from the shore is the key predictor for how long a rising sea will take to convert dry land to wetlands. Land elevation is something that an owner can change by adding sand, soil, or other fill materials. Similarly, although the width of a natural beach is fairly constant for a given wave climate and sand size, the width of the strip of wetlands can vary greatly. While the inland and seaward boundaries of a beach retreat together, the inland and seaward boundaries of tidal wetlands can migrate independently: Migration of the inland wetland boundary as sea level rises depends primarily on land elevations, while retreat of the seaward boundary depends on wave erosion and the ability of the wetlands to keep pace through sedimentation and peat formation. Although beach nourishment and dune construction can move the beach seaward, they generally do not narrow the beach after an initial adjustment. By contrast, efforts by owners to elevate dry land can narrow the wetlands by preventing their inland migration even while the seaward boundary erodes. Boat traffic can erode the seaward wetland boundary without causing the inland boundary to move inland. The inland boundary of tidal wetlands is not a straight line that is easy to discern. While storms often destroy homes along an eroding ocean shore within a few years after they encroach seaward of the dune vegetation line, homes along wetland shores are less vulnerable to storms. The confusing law of avulsion is usually not an issue along wetland shores (except possibly in the five states where private land extends to mean low water). Although the seaward edge of tidal wetlands may erode suddenly during a storm, the mean high tide line retreats gradually inland as sea level rises. Box 2. Land Elevations, Tides, and Wetland Zonation. Tides are caused by the gravitational attraction of the moon and sun on the ocean water. The tides usually rise and fall twice each day. Along the Atlantic Ocean, the two high tides are similar. Along the Pacific Ocean, by contrast, one of the high tides is much higher than the other. The daily tide range varies over the course of the lunar month. Mean high water and mean low water are the average elevations of the daily high and low tides. The higher of the two high tides is known as mean higher high water. During full and new moons, the gravitational pull of the moon and the sun are aligned, which causes the tide range to be 15-25 percent greater than average. During half moons along much of the Gulf Coast, there is only one daily tide. The average of the full and new moon high (and low) tides is known as spring high water (and spring low water). Daily tide ranges are as greater than ten feet in some places, but only a few inches in some estuaries. In addition to the astronomic tides, water levels fluctuate due to wind, atmospheric pressure, ocean current, and-in inland areas-river flow, rainfall, and evaporation. The figure shows tidal elevations for Hampton Roads, Virginia. In coastal areas with tidal marshes, the high marsh is generally found between mean high water and spring high water, while low marsh is found from slightly below mean sea level up to mean high water. In bays with small tide ranges of about half a foot (10-20 centimeters), however, wind and seasonal runoff can cause water level fluctuations with a greater impact on tidal wetlands than the tides themselves. These areas are known as "irregularly flooded". In some locations, such as upper Albemarle Sound in North Carolina, the astronomic tide range is essentially zero, and all wetlands are irregularly flooded. Freshwater wetlands in such areas are often classified as "nontidal wetlands". because there is no tide. But unlike the situation in most nontidal areas, the flooding and risk of wetland loss are still controlled by sea level. Wetlands that lie at sea level along an estuary with a very small tide range are more accurately called "nanotidal wetlands"
Thus, for a rolling easement to ensure preservation of wetlands, it would generally have to prevent the landowner from adding fill to elevate the grade of the yard, or at least ensure a return to the original grade at some point in the future. As with a beachfront rolling easement, shore protection structures that stop the landward edge of the wetlands from migrating inland (e.g., bulkheads) must also be prohibited. Breakwaters, sills, and biologs that slow erosion of the outer marsh edge, by contrast, could be compatible with a rolling easement. Whether a rolling easement would have to directly require removal of homes in the wetlands would depend on site-specific factors beyond our scope herebut if removal is important, responsibility cannot be easily shifted to the next hurricane. Similarly, responsibility for site cleanup may have to be specifically allocated. 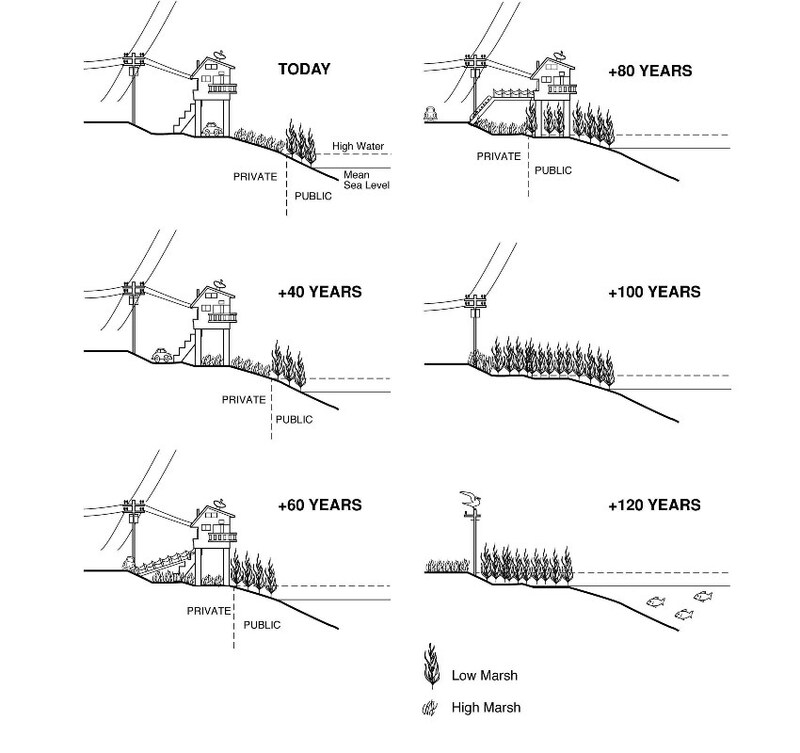 Figure 6 shows how this rolling easement could play out over time for the typical case where the private/public boundary is mean high water, and therefore the high marsh is privately owned while the low marsh is publicly owned. A rolling easement allows construc­tion near the shore, but requires the property owner to recognize natures right-of-way to ad­vance inland as sea level rises. In the case depicted, the high marsh reaches the footprint of the house 40 years later. Because the house is on pilings, it can still be occupied, assuming that it is hooked to a sewerage treatment plant. (A flooded septic system would probably fail, because the drain field must be a minimum distance above the water table.) After 60 years, the marsh has advanced enough to require the owner to park her car along the street and construct a catwalk across the front yard. After 80 years, the marsh has taken over the entire yard; moreover, the footprint of the house is now seaward of mean high water, and hence is on public property. At this point, additional reinvestment in the property is unlikely. Twenty years later, the particular house has been re­moved, although other houses on the same street may still be occupied. Eventually, the entire area returns to nature. This primer assumes that the mission of a rolling easement is accomplished once the rising sea submerges a given parcel.In most cases, a rolling easement designed to allow wetlands to migrate inland will also enable the public/private boundary to move inland, because that boundary is either the mean low tide line (in five states), the mean high tide line (in most states), or another point defined based on the characteristics of the shore. At some point of submergence, privately owned land will become publicly owned water. Because an owner can never transfer that which she does not own, a rolling easement does not restrict what the state can do with the land once it is submerged and becomes wetland. In the rare case where a land trust believes that a state is likely to fill the wetlands once they become publicly owned, a rolling easement might not be advisable. Figure 6. Migration of Wetlands and Boundary between Public and Private Land, with a Property Subject to a Rolling Easement. Source: MARYLAND LAW REVIEW. See note 7. Assuming that the new sand is similar to what was already on the beach. The width of the beach depends on the grain size of the sand and the wave climate, with fine-grained sands and larger waves both causing a wider beach. See Per Bruun, Sea Level Rise as a Cause of Shore Erosion, 88 Journal of Waterways and Harbor Division. American Society of Civil Engineers 117130 (1962). See supra § 2.2.1 for a discussion of the boundaries of public ownership and public access along tidal shores. In five states, the boundary is mean low water; and in a few states the boundary is a natural high water mark that may be above mean sea level due to waves. See supra notes 5154 and accompanying text. In a few places, where states have conveyed submerged lands to the owners of the adjacent dry land, the boundary no longer moves with the shoreline. See supra note 57 and accompanying text. The goal of the rolling easement is to prevent shore protection that would eliminate the intertidal wetland, beach, or public access. Once the parcel is submerged, shore protection is only possible if the land re-emerges and then begins to submerge once again. If the land re-emerges suddenly (or gradually as an island), the state is the new owner. If it emerges gradually and is connected to some other land, it would belong to the owner of the adjacent land and generally be subject to whatever conservation easements (if any) applied to that parcel. A land trust and landowner may agree to elevate the grade of high marsh, for example, which would be environmentally preferable to the state filling the land and would also allow the landowner to retain title to the land. Living shoreline approaches may also be viable. But these issues are generally best left to those who manage the rolling easement when the land submerges: a current inclination by the state to fill wetlands would have little bearing on what the state will want to do 100 years hence.